loss of the desire to work at a steady job. Yesterday was a busy and interesting day. 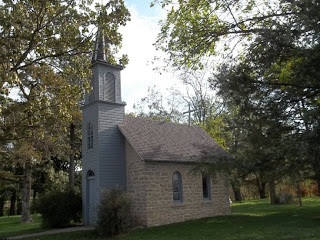 After getting started early, I visited the little church near Festina, Iowa. The tiny chapel is named for St. Anthony of Padua. In 1849 the first chapel – a log structure – was built. In 1885 nearby landowners quarried the stone to build this structure. This mini church was built after the mother of Johann Gaertner vowed to build it following the safe return of her son. He had been drafted to serve under Napoleon in the French army during the Russian campaign. 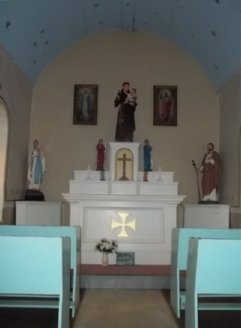 The small church has only four small pews. From the small church it was a short drive to the town of Spillville, Iowa. Spillville was the home of the famous Bily brothers, Frank and Joseph. Farmers and carpenters by trade, Frank and Joseph worked as a team during the winters to design and hand carve some of the most incredible, beautiful clocks imaginable. Many of them have beautiful movable parts as well as high quality German chimes. I was astounded by the intricacy of the fine time pieces. 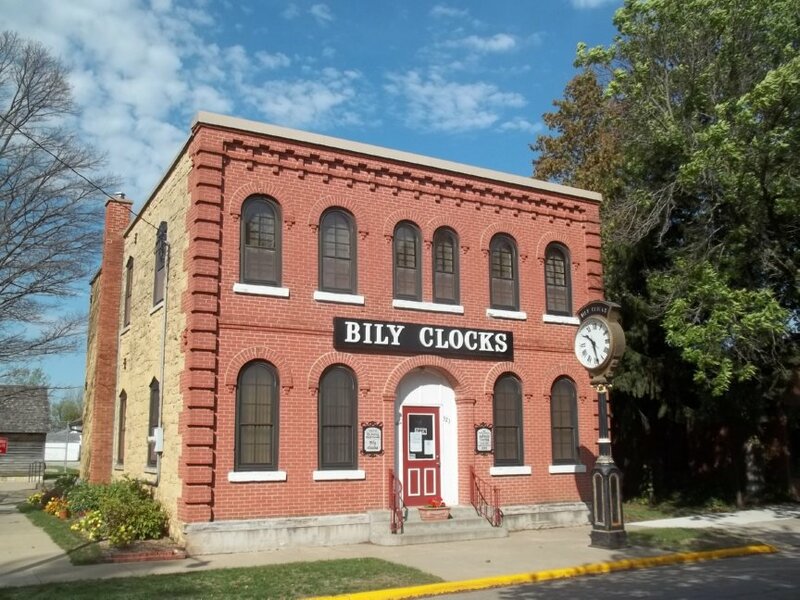 If you are in this area, the Bily Museum is a must see. 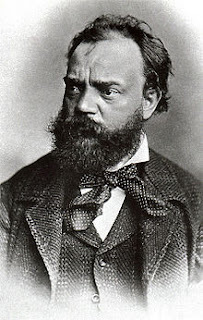 In addition to the many clocks such as the one featured at the right, the museum also has a whole exhibit dedicated to the famous Czech composer, Antonín Leopold Dvořák. At only $6 for admission, the tour is a lot of fun. 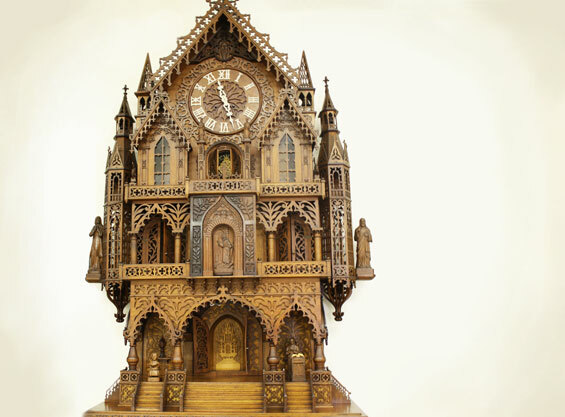 You will be astounded at the detail carved into each of the clocks and the wonderful theme to each one. I liked the “Parade of Nations” clock which had a number of carved wooden people, each wearing traditional garb for the respective country. One such clock depicted different means of transportation. Another featured various types of sporting activities. What was so remarkable is that some of these clocks were completed in as little as four months. As the tour guide mentioned, this was during a period where the was no television. Think of what we could accomplish if that was still the case! 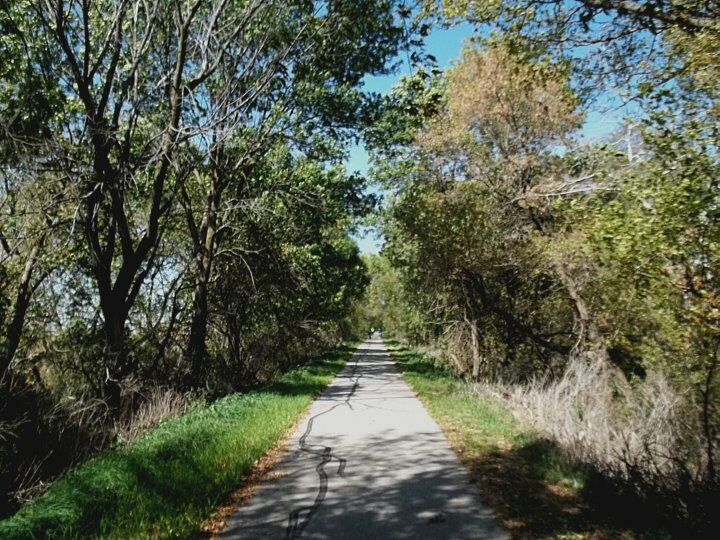 The next stop was a little biking trip. What you see here is a portion of the Prairie Farmer trail – a segment running from Cresco (near the Minnesota border) back to the town of Ridgeway. Unfortunately, the wind was so severe the bike ride had to be cut short. I rode into a headwind for some time only to have a cold front come through, the winds reverse, and then had another headwind on the way back. The winds were nearly a constant 25 miles per hour! This my new buddy, Teddy. Teddy’s job is to occupy a sink hole on the trail to keep bikers from falling into it. This portion of the path needs some work on it. 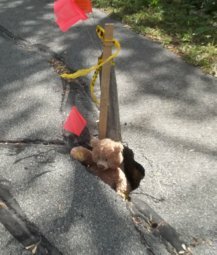 Red flags warn riders of impending dangers but someone stuck this cute little teddy bear in the deep hole. Yes, he’s up to his shoulders! A hazard such as that could ruin a day… and a bike rim. These are “Healthy Crab and Shrimp Cakes”, sort of my redneck, ghetto gourmet take on a true classic. Most seafood lovers (like my tomcat Mr. Jesse) can’t get enough of these things. Jesse might not like these. I made them spicy (optional). The batch of them cost me about $7 which is not bad considering it covered two meals (dinner and the midnight snack). 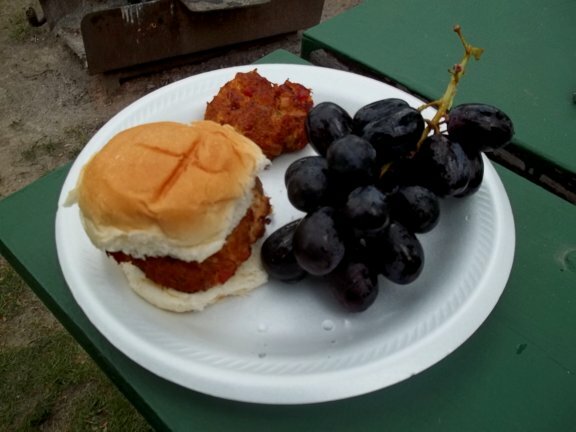 What you see in the picture (with the exception of the grapes) was cooked on a sheet of non-stick foil laid in the same little charcoal grill from that opening picture. I smoked them with a little cherry wood while they were sizzling on a light coating of garlic flavored olive oil. A non-stick skillet might even work better. Stir the crabmeat and juice together with the bread crumbs, adding the egg substitute. Add in all the rest of the ingredients and mix well. Form into eight patties and cook in a skillet with a little olive oil. (or cook on the grill). By morning, all the crab cakes were gone. That’s okay – there aren’t a whole lot of calories in them! At the time this post was written, it is early Thursday morning. I’m getting ready to go trout fishing again today. The trout hatchery is stocking the streams today. Catching five will be easy! The dinner tonight is going to be a thin crust, beer bread and olive oil crust pizza featuring locally made Italian sausage and fresh mushrooms, onions, and green peppers. 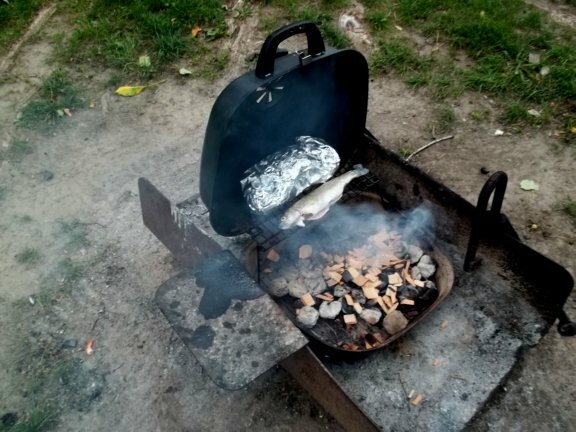 It is going to be cooked over the grill… just as the 5 trout I’m planning to take home! Have a wonderful day and thanks for stopping by.